The Grissom High School Marching Tiger Band consists of instrument-playing members in the three band classes, plus the Color Guard. We have 2 types of marching bands. The Football Band and the Contest Band. The Football Band includes the entire Marching Band that attends football games throughout the football season, performs a pre-game show at all home football games and marches in local and invitational parades. The Contest Band is by audition and will perform the half-time shows and at marching contests. Any reference or mention of MARCHING BAND on the calendar or any handouts includes all Football and Contest Band Members. The Contest Band performs half-time shows at all football games throughout the football season and usually attends one or two marching contests. These contests are held on Saturdays during the fall with a short rehearsal prior to departure. Occasionally this is an overnight trip. Refer to trip information included in the Band Handbook. 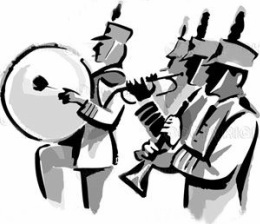 All members of the Grissom High School Marching Band (Football Band and Contest Band) will attend the marching contests whether they perform or not. The Football Band students need to see what a marching contest is all about so they can be ready to audition the following year for the Contest Band if they so choose. A schedule of summer band practices is distributed and posted on Charms each Spring. "Rookie Camp" is for incoming freshmen and anyone else who will march with the Grissom Band for the first time that fall. "Rookie Camp" usually lasts 5 days and is normally held the week after school ends. "Pre-camp" is held for three days prior to Band Camp where the marching music is learned and marching fundamentals practiced. The following week is "Band Camp" with morning, afternoon and evening rehearsals of the marching program. These two weeks are required for all marching band members. The percussion section’s summer practices will be decided in the Spring each year. Auditions for the Contest Band Percussion Section are held in May with clinics prior to auditions. Percussion Camps are held during the summer, with clinicians brought in to work with the section. All of these rehearsals are very important and attendance is required. 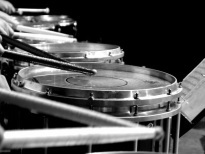 Summer percussion rehearsal schedules are given as soon as possible depending upon the clinicians’ schedule. All members of the Contest Band percussion section will pay the instrument rental fee for all 3 semesters; summer, fall and spring. Football Band members will pay 2 semesters Fall and Spring. Members of the Color Guard are selected by auditions held in May of each year. All of the members of the Guard are scheduled in one of the band classes as playing members or in the Color Guard class. Prior to auditions a clinic is held after school at Grissom to teach basic flag techniques and dance coordination. This clinic is required for all students auditioning for a position in the Guard. Parental permission forms and grade sheets are also required before a student can audition. An overall 70 average in all academic classes at the end of the spring semester is required to be a member of the color guard. Attendance at summer rehearsals—two days a week from 6:00 to 8:00 AM beginning in June. Family vacations are excused, but guard members are expected to only miss a few of these rehearsals. It is very easy to get behind. Attendance at Guard Camps—week-long camps scheduled in June and July at Grissom. Our Color Guard Instructor will be here to teach equipment work for the marching drill and work on fundamentals of choreography and dance movement. Any member missing these camps could be chosen as an alternate. Paying Band Dues—as set each year by the Grissom Band Parents Association. These dues covers the cost of Guard Camp, Pre Camp, Band Camp, uniform rental, shows flags, rifles and sabers, transportation to football games, contests, and a general operational fee. These dues or a partial are due at the first Guard Camp in June. A payment plan can be set up with our treasurers if needs arise. Wearing a "Spirit Uniform" on game days—uniform pieces consist of orange shorts, white jersey, white GHS sweatshirt, white "Keds" tennis shoes, and white socks. Each member is responsible for purchasing this "spirit uniform", which is not included in the band fees. Maintenance of flags/rifles—Each guard member is responsible for the purchase of a practice flag and/or rifle. Performance flags and rifles are supplied by the band. Following all rules and regulations of the Grissom High School Band of which you are a member. Your placement in one of the bands is based upon your performance at an audition. Auditions for first semester are held at the end of each school year. Auditions for the second semester are held at the end of the first semester. These auditions are also used as an exam grade. It is possible for you to move up or down a band at the change of semesters or from one year to the next. (It is also possible to change chair positions within your band by challenging the player above you - see "Challenging Procedures" in the student handbook. 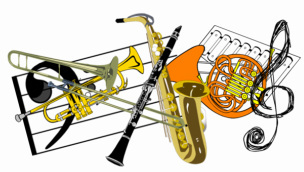 Sometimes the Symphonic Band 1 or 2 will receive an invitation to perform at a convention or festival during the Spring and will have an additional band trip. After School Symphonic/Concert Band rehearsal schedule for 2018-2019. NEW for 2018-2019 school year! Thursday afternoons will be open for sectionals with any band and any section. These will be announced at least a week in advance. During the early part of the 2nd semester each year, all three bands participate in a Concert Season Band Camp. Students will be involved in full band rehearsals with a guest conductor; master classes on their respective instruments with guest faculty, recitals by guest faculty and Grissom students, clinics, and perform an informal concert at the conclusion of the camp. Grissom began this program in 1995. These camps are held from Thursday starting at 4pm through the Saturday afternoon final concert. This is a required activity which is included as part of your Band Fees.